In my last post I introduced the four steps for creating. Today it’s all about step one: generating ideas. More specifically, it’s about how to help kids keep their ideas flowing as they grow up. Young kids have a constant stream of light bulb moments and that flow tends to slow as they age. Coming up with ideas is not only fun, it’s critical to creating and problem solving and it’s on my parenting (and teacher) radar to help kids sustain their innate ability to generate ideas as they grow. In our house we’ve finally arrived – my boys (age 2 and 4) can go from one idea to the next, playing well together for nearly 10 whole minutes. They construct play spaces, have dance parties, and fix all kind of ‘problems’ (masking tape is a staple on the shopping list) with no adult intervention. True parenting bliss, albeit brief. But I know where we are headed – I remember being crazy bored as a kid and my art students often have the toughest time coming up with ideas. Somewhere along the way, our little free spirits will begin to see the world through a much smaller lens, with fewer possibilities. Keep them BELIEVING that there are always many solutions to a problem. There are lots of creative ways to help kids generate and capture ideas. 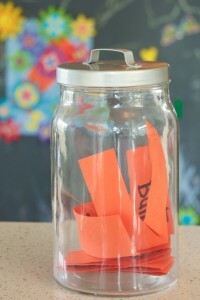 We have an ‘idea jar’ filled with ideas for activities. Making lists or simple asking the question: What else? What’s another way? The point is, encourage kids to come up with multiple ideas. Make it routine so they internalize the fact that there are lots of possibilities. To be ‘idea prone’ we not only need to believe that there are many ways to solve a problem but also believe that we are capable of coming up with the ideas and solutions ourselves. My motto is to help in the smallest increments possible. It isn’t easy to wean ourselves off doing things for our kids. I know, I spoon fed my first until he was 2, but with this in mind, the best thing we can do is get out of their way. I now try to remember to take a deep breath and allow my kids to do things for themselves, even though we are running late, a mess is inivitable or the shoe is on the wrong foot. Finally, help your child to recognize a ‘job well done.’ Rather than saying, “I’m proud of you,” try saying- “Are you proud of yourself?” Self-confidence comes from a true belief in oneself rather than approval from others. Seeing our kids light up with excitement to pursue a new idea is one of my favorite parenting moments. I am reminded daily by my little guys that possibilities are endless. I also realize that overtime that ingenuity may need to be cultivated and tended to in order to be sustained. I hope these tips are helpful in nuturing your child’s sense of possibility and are also good reminders for yourself that ideas are many and everything is figure-outable. I’ll see you back next week with lots of great tips for step two of the creative process: Mapping Out your Idea. Do you have ideas for generating ideas? How do you brainstorm? This entry was posted in Creative Process by admin. Bookmark the permalink.